Seems like a kind person, but sees BPO as so evil that even trying to make a difference in the world will do harm. Considers Riley to be too close to “their [way of] thinking,” and refuses to share much information with her. 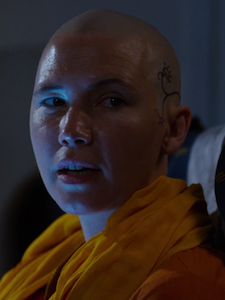 Bodhi is part of the Lacuna, poised to be their next Mother, and has powers beyond that of a normal Sensate, including the ability to block without blockers and introduce herself to people she’s never met.